Blue Artichoke Interiors: It's All Too Much! I wouldn't be eligible for a show like Clean House or Hoarders and yet I feel like I have too much stuff! I have a fairly neat home and I am not too embarrassed by how I maintain it and yet I do tend to make piles. I know many out there can relate to this. Over the last few decades the average American home continues to grow in size and yet many of us still feel overwhelmed by our possessions. The self storage facility business was unheard of until the late 60's and now every one in ten families uses one to store their excess stuff. Many more families are busting at the seams. I have found a great book by the guy who was the organizer for TLC's Clean Sweep program. 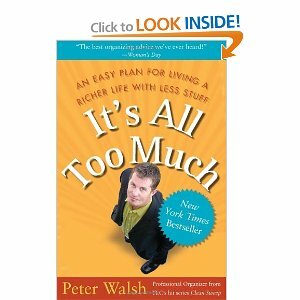 Peter Walsh is his name and he will have a new show called "Enough Already! with Peter Walsh" on OWN: The Oprah Winfrey Network. His message resonates with me and here's why, the subtitle of his book is "An Easy Plan For Living A Richer Life With Less Stuff." I am at the stage in my life where I just want peace and serenity. I want my home to be a sanctuary for me and my family. See, I told you they were adorable. I would show you pictures of my girls, but teenagers don't like their mother showing the world their pictures. With almost 22 years of marriage, two kids and two dogs comes a lot of stuff. I have a three car garage and not a single car fits in. So while my house looks fairly good with the exception of some of my piles, my bedroom is not the sanctuary I long for and my garage is a disaster. I have lots of furniture to be refinished and projects to get completed in there. Many things to sell or donate, you know the story. So through Peter's book I have got the motivation to make my life more fulfilling by having less. I started my purging process yesterday with my home entry. I went through my mail from vacation and my entry looks good, but I need to clean out my entry cabinet. I know I have some old papers to recycle and some excess things that can be tossed. I'll be devoting some time every day to this process and will be harsh about it. My goal is to get rid of anything if I do not love it. I want to love everything in my home and truly make it a reflection of me. Are any of you experiencing the desire for a home that evokes calm and serenity? Share your story with me because I would love to hear it! I have a story too . . .with too much stuff. I think it has more to do with all our interests, hobbies and businesses and the need for more organization for all of these. We recently moved *things* to deal with later for my daughter's graduation party and I love the cleaner lines and *sparseness* of it. And I was just thinking the other day and said to myself " nevermind new projects to find, concentrate on the projects you've always wanted to get to...for yourself, your home, and your family.". so that's my plan and thanks for the heads up on the book. I'll be following to see how it works for you. I can so relate...my hubby would love to be able to park his car in the garage but I just keep buying more bargain chairs to fix up. I'm trying to be disciplined and not buy any more until I finish off the ones I've got. You've just received an award on my blog :) Stop by to check it out! Ah... the story of my life. It's an ugly thing when 2 packrats marry. I've been working to clear the clutter and have been doing fairly well. I really like Peter Walsh and I'm pleased to hear he'll have his own show.